For the past eight years, journalist Rebecca Lang and writer/photographer Michael Williams have been piecing together the legend of Australia’s mysterious ‘black panther’. They have travelled all over Australia interviewing farmers, hunters, hikers and ordinary Australians, investigating sightings and unexplained stock deaths, chasing DNA results and delving deep into the history books and archives to pull together Australian Big Cats: An Unnatural History of Panthers, a meaty compendium of sightings, killing sprees, narrow escapes, myths and mysteries that have come to form an intriguing chapter of Australian folklore. They also recently wrote the foreword for, and re-published, Savage Shadow: The Search for the Australian Cougar, under their Strange Nation Publishing imprint. 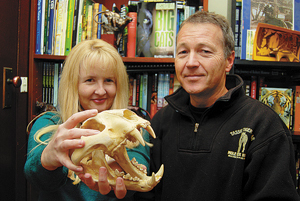 Their experiences and discoveries have been featured in various documentaries including the Discovery Channel (Animal X) and most recently in the NZ-based ‘Prints of Darkness’ by Mark Orton and Pip Walls. The authors’ work has also appeared in many magazines including The Australian, Australian Shooter, Big Cat Yearbook 2007, the Centre for Fortean Zoology Yearbook 2009, Nexus Magazine, the Fortean Times, and the Fortean Times Paranormal Handbook (2009).